Rhone Valley There are 8 products. The colour is a deep garnet red. The nose is essentially fruity, with strong aromas of cassis and plums, an a touch of violets. 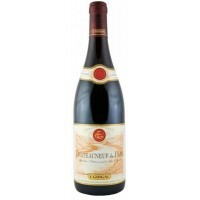 This is an ample, well-rounded wine in the mouth that has sufficient tannins for ageing capacity. A wonderful and soulful Vacqueyras, full of the region’s famous garrigue (a spicy, herbal notes that is irresistible for Rhone fiends). Based largely on Grenache, as all Vacqueyras must be by law, this 2015 is packed with ripe boysenberry and raspberry fruit culminating in a very pretty, graceful finish. Deep dark red fills the glass while the inviting nose of Spices and mature red fruits draws you in. On the Palate this wine has Round tannins with powerful complexity. A rich unctuous wine with notes of mature plums, hazelnuts and red fruits. Oerall this is a very rich wine full of harmony and balance. Yellow gold, clear and brilliant. 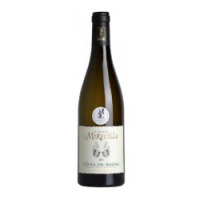 On the nose, freshness marked by the distinctive aromas of Viognier, white flowers, apricot, acacia and white peach. On the palate, it is fruity with plenty of richness and body. Overall, a well-rounded wine with elegance, strength and balance. 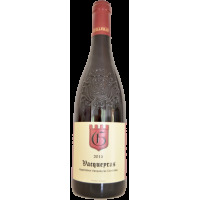 A full bodied, rich and well-structured wine with a powerful nose, in which the Grenache grape is very present. This complex wine will develop towards spice and leather with time. COLOUR : bright golden yellow hue. NOSE : intense and expressive. Aromas of apricot, fennel and floral scents (iris, etc.). MOUTH : complex and very elegant. The wine’s roundness is a perfect match for its freshness. And the finish reveals subtle notes of aniseed.